30 Minute Pizza Crust is quick and simple because there is no need for rising time. Divide the dough into mini crusts so everyone can create their own perfect pizza snack! This is a sponsored post on behalf of Fleischmann’s® Yeast. Thank you for supporting the brands that continue to make My Baking Addiction possible. It’s clear from my Facebook feed that it is back-to-school week in many areas. I’m seeing so many photos of littles dressed in their freshly pressed clothes, posing with little chalkboard signs for their first day of school. And I’ve got to admit, it gives me a little – okay, a lot – of anxiety, because Elle will be one of those littles next fall. It makes me sad, happy, and proud all at the same time. Clearly, I have about 365 days to get a grip on these emotions so I’m not that parent, hysterically crying outside the preschool classroom door. And trust me, I’ll need all 365 days. Even though Elle isn’t in school quite yet, we still have a pretty full schedule of activities planned for her this fall. Between toddler gymnastics, nature school, and swimming lessons – my babe has a better social calendar than most adults I know – including me. Although I’d love to tell you that I’m amazing with meal planning, the truth is I’m not. We’re often scrambling to come up with lunch, dinner, and snack ideas at the last minute. But if there’s one thing I can count on Elle eating, it’s pizza. Not only does she like to eat pizza, she loves to help make them – especially mini pizzas. She’ll happily sauce and top pizzas while sneaking pepperonis any day of the week. If I’m being honest, sometimes I take a shortcut and use whole wheat English muffins for her crust, but I’ve been stepping up my pizza game lately by using this 30 Minute Pizza Crust from Fleischmann’s® Yeast. It comes together in minutes using a just a handful of ingredients. My favorite thing about this dough is that there’s no long rise time involved. 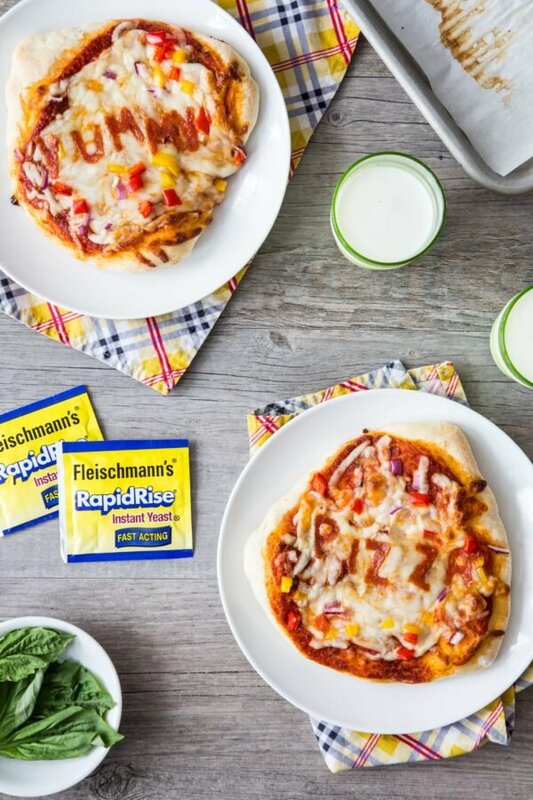 Simply wait 10 minutes and let Fleischmann’s® RapidRise® Yeast do the rest. Just toss everything into a bowl, mix up, give it a good kneading, and let it rest for 10 minutes. Pat the dough into a pizza pan, add on your favorite toppings, and you’re good to go. We like to divide our dough into 4 equal pieces so everyone can create their own. Put all of your favorite toppings on the counter and get your kiddos involved in a pizza-making assembly line. 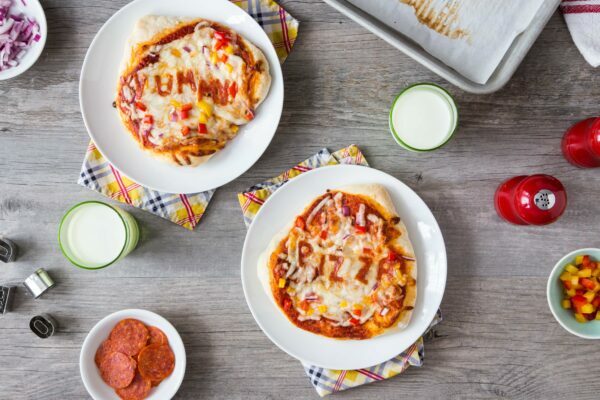 If you’re feeling fancy, you can make the mini pizzas a little more fun by using small fondant or cookie cutters to spell words or create fun shapes out of pepperonis. 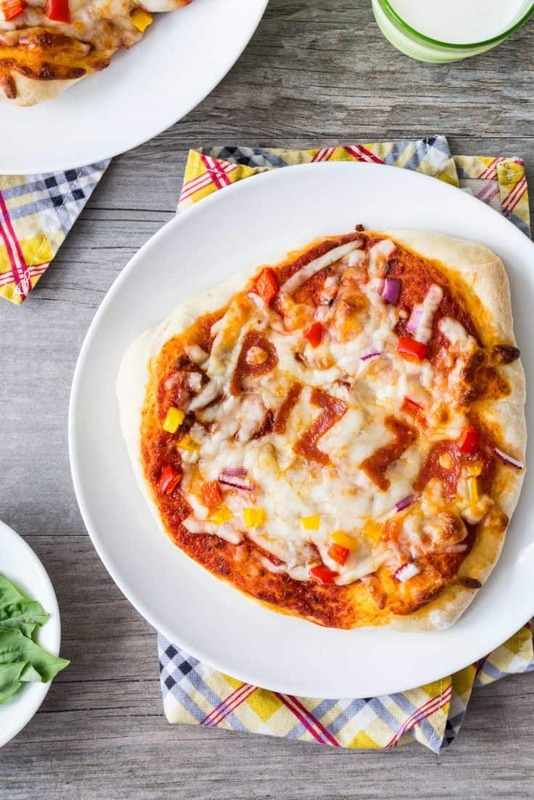 Whether you’re whipping mini pizzas up at the last minute for a weeknight dinner, or letting the kiddos get creative for an afternoon snack, you’ll definitely want to give this 30 Minute Pizza Crust a try. And be sure to bake a little extra because what’s better than homemade pizza? For more easy, delicious recipes using Fleischmann’s® Yeast, be sure to check out this Cinnamon Pull-Apart Bread and these Caramel Apple Cinnamon Rolls. Add very warm water and oil; mix until well blended, about 1 minute. Gradually add enough remaining flour to make a soft dough. Dough should form a ball and will be slightly sticky. Knead** on a floured surface, adding additional flour if necessary, until smooth and elastic, about 4 minutes. Let dough rest for 10 minutes. If making mini pizzas, divide the dough into four equal portions and pat or roll dough to create 4 mini crusts. **To knead the dough, add just enough flour to the dough and your hands to keep the dough from sticking. Flatten dough and fold it toward you. Using the heels of your hands, push the dough away with a rolling motion. Rotate dough a quarter turn and repeat the fold, push, and turn steps. Keep kneading dough until it is smooth and elastic. Use a little more flour if dough becomes too sticky, always working the flour into the ball of dough. Crust can be used to make one thick crust 9-inch pizza. Increase baking time to 20 minutes. These are so cute! I wonder if my daughter would like me to make them for school lunch. The pepperoni cut out words are just the cutest! Thank you, Amanda! I appreciate it! I am swooning over the pepperoni letters! How fun! I love Fleischmann’s yeast. They never fail me! I love Fleischmann’s, too! I hope you enjoy these, Anna! It’s now my granddaughter who headed off to kindergarten – and yes, I got choked up…it’s the whole she’s going to be influenced by other kids & adults from now on — and how did she get so big so fast? I babysit my grandkids for my daughters and sons-in-law; my oldest grandchild is now starting 4th grade — how time flew by so fast I don’t know! 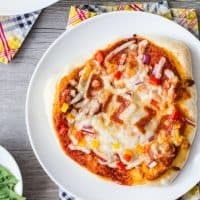 They all love pizza, and this recipe is a fun and easy meal! Time does go by so fast, doesn’t it, Kathleen? 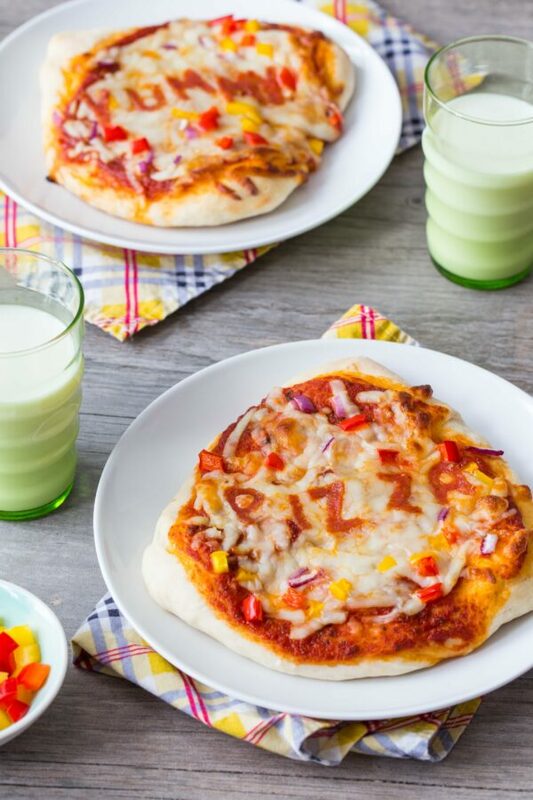 You sound like a wonderful grandmother, and they will love making these pizzas with you. All the best to you! Those pizzas are too cute! I love how you cut out “pizza” and “yummy”! Wow, I want to eat all of these for lunch!! Love your video & these pizzas look sensational — that crust! You go girl! Great Ideas! Love those mini pizzas actually. You just solved my problem of eating urges and snack problems in between teaching hours. I’m gonna try them for sure! Thanks so much, Alicia! Enjoy! this actually makes a 14″ pizza, much too thick for a 12″. I adjusted the recipe for my 12″ pan. Love the recipe, it’s actually better than using my bread machine to make the dough, just a bit more work cause I have to knead it. I’m so glad you like the recipe, Pat!